Nintendo's Metroid saga has always been a rich and inviting science fiction landscape with memorable characters, narratives, and a heroine who won't quit. Samus Aran is an enormous part of the Metroid universe, but she's hardly the be all and end all of Metroid, period. Swirling around Samus is a wide world of lore that's deserved a closer look since it was established, and that's exactly what Metroid Prime: Federation Force does. 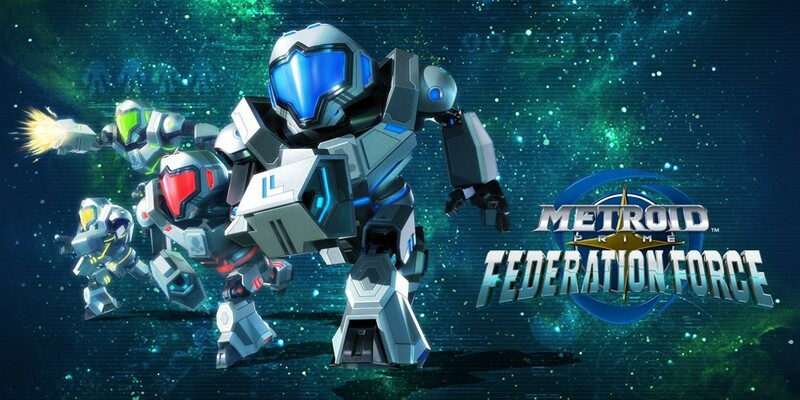 Following the Galactic Federation Force, which you've seen referenced across several prior Metroid titles, Metroid Prime: Federation Force is a game from the perspective of new recruits, scheduled right after the in-universe events of Metroid Prime 3: Corruption. You'll take control of newly-trained GFed soldiers, outfitted with robotic suits of armor that are looking to become even more technologically advanced than the Space Pirates. It's your job to participate in Operation Golem, as it were, and the game takes place from the beginning of your journey. You can choose to dig right into single or multiplayer modes, with the single player campaign sending you to three different planets: Excelcion, Bion, and Talvania, each varying in terrain from frozen tundras to gaseous death traps and the desert. It's pretty much par for the course, and there are 22 missions to navigate in single player. From mission to mission you'll be required to solve puzzles and navigate each planet and all its hazards. That's the kind of jobs rookies get, after all, shooting up enemies and figuring out environmental dilemmas. Each mission comes with its own set of objectives to complete and loads of lore to uncover if you're willing to look, with logs scattered around the mission area containing valuable pieces of the Federation Force back story. You can look for those things and There's never a shortage of things to do, even though your robotic armor isn't as agile as, say, Chozo armor, but combat is fast, frenetic and fun. You can change out your mech's loadout in relation to its weight, but there are several different mods you can use to change up your kits as well. This is really something that comes in handy when you tackle the game with other people, as you can complement each other depending on the type of equipment you're each outfitted with. There are several augments that can make things simpler for you when you're playing alone as well, like a special mod that lets you up your damage count considerably while halving what you take, and you can only use it in Solo mode. As fun as Federation Force can be alone, it truly shines with cooperative play. You're honestly meant to play with a four-player squad of indomitable mechs, and you can either play locally or online to pick up additional players. Each mission you unlock via Solo campaign can add other human players in for the long haul. If you're playing the added Blast Ball game, you can have two teams of three mechs for a fun little sports interlude. The online play I managed to get in was smooth and lag-free, though I wasn't able to play as much as I would have liked. It's abundantly clear the game is built around the idea of hopping online with your friends or searching out a squad to tackle the game together, especially when it comes to customizing loadouts, solving difficult puzzles, or just learning to cooperate together. Unfortunately there's not much customization to be had from mech to mech beyond their colors and paint jobs, and the augments you install aren't visible on the mechs themselves. You can also choose a voice for your trooper, though there is voice chat support for you to communicate with players online, so that's one glaring caveat for online play, but it's not an insurmountable issue. The best way to play with others is by far to invite local players along, but that may be difficult if you don't know enough people with systems to trap in a room with you to play at once. Metroid Prime: Federation Force is akin to games like LBX: Little Battlers' Experience or the Custom Robo games in that you get these powerful mechs to customize and traverse several different missions with, all the while able to bring friends to join in on the fun. It's chock full of Metroid lore, even if it's not the Metroid game you think you should have gotten after all this time. Had it been released under a different name, it'd be a perfectly serviceable mutliplayer mech adventure, but even with the Metroid name it's well worth picking up for a fun little weekend jaunt, especially if you're the type to return again and again to a game to best your previous scores and advance from there, you'll find an excellent entry in the Metroid series here. This review is based on a physical copy of the game that was provided by the publisher. Metroid Prime: Federation Force is available now on Nintendo 3DS for $39.99. The game is rated T. This review originally appeared on Shacknews.